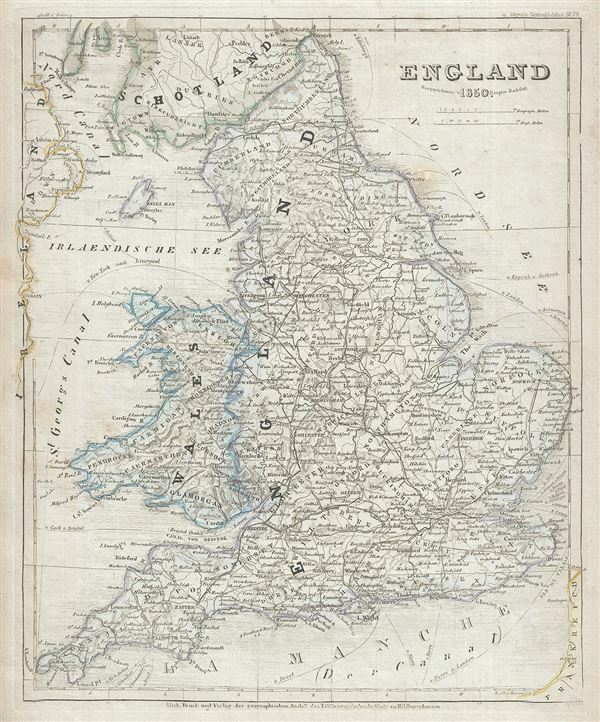 This is a fine 1850 map of England by Joseph Meyer. It covers both England and Wales from Northumberland to Cornwall and from the St. George's Channel east as far as the Strait of Dover. The Isle of Man is also included. The map identifies various cities, towns, forts, rivers, rapids, mountain passes, fords, and an assortment of additional topographical details. During this time, both England and Wales were in the midst of the Industrial Revolution, wherein much of the rural agricultural population was relocating to urban centers. This map was issued as plate no. 73 in Meyer's Zeitung Atlas. Although all the maps in this atlas are not individually dated, the title page and maps were often updated while the imprint with the date was not, causing confusion to the exact date for some of the maps. Moreover some maps in the atlas were taped in at a later date as an update to the atlas. We have dated the maps in this collection to the best of our ability. Very good. Minor overall toning and some spotting. Dampstain in upper left margin.